What is an Internship or Co-op? 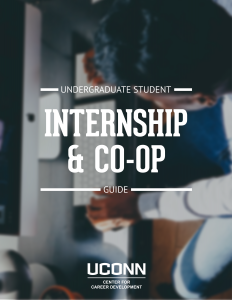 Define and clarify the types of experiences only offered at UConn through “What is an Internship or Co-op?”, as well as read about legal issues for unpaid internships and best practices for all opportunities. Searching online is one way to locate an internship or co-op, and it can be overwhelming. Use Off-Campus Opportunities to see a manageable number of legitimate and helpful sites, both in and outside of the United States. This page also has information related to finding housing in select cities. See how UConn students have succeeded in their internships. Students, make the most out of your internship experience – check out our Internship and Co-op Guide.